I have several nieces and nephews that are 3 and under. Getting presents for them can be pretty tricky sometimes. With random growth spurts, changing their mind constantly, you really have to keep on your toes to make them happy. I know you’re saying you shouldn’t impress anyone, but seeing a child open a present (especially on Christmas) with excitement, better yet seeing their reaction when they realize what their present and they actually like it is even better… so of course you want to buy something good. Here are a couple ideas for the holidays. I really LOVE giving kids books for the holidays. I loved being read to at night by my mom when I was younger. I also read to my sister sometimes when she was younger (we’re 6 years apart). There’s something so cherishing about those moments that make my heart melt… and ALMOST make my biological clock tick especially when I hear that my niece asks my sissy (SIL) to read to her every night. LOVE IT. Plus I really do believe the studies about reading to your child at a young age and how it helps their development. One day I was watching a daytime talk show and I heard about Julie Andrews and her daughter’s children’s books. 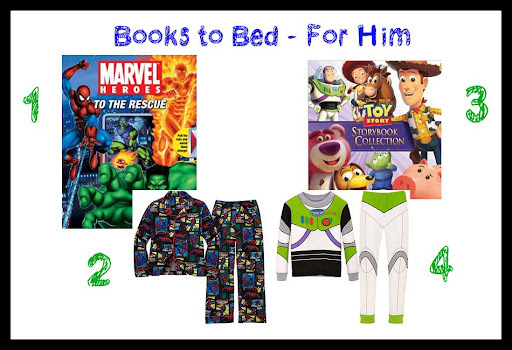 One of the books was actually was part of this promotion set called books to bed, which is a gift set of a book and the corresponding PJs. I thought that was SUCH a great idea especially for kids that really like to be read at night; HOWEVER, the selection is pretty limited and it’s pretty costly. While some kids don’t mind what story they’re read at night, others have specific requests, so this is something you could DEFINITELY d.i.y and make a personalized gift set (which btw, I LOVE doing! I love related presents and packaging them up together!). There are SO many book options on Amazon, Borders, Barnes & Noble, etc. (depending on the book, it may be pretty cheap). You can find PJ’s at Target, Disney, Walmart, etc. Because children grow so quickly they don’t have to be expensive PJs, being on a budget here is feasible and OK. Kids will cherish the gift especially if its a character they like. For me, almost all my nieces LOVE the Disney Princesses and Fairies or Dora. My nephews like the typical boy characters, Spiderman, Marvel Heroes, IronMan, Superman, etc. The unisex characters they like are Toy Story 3, Yo Gabba Gabba, The Wiggles, Berenstain Bears (OK, that’s one of my fave childhood books), etc. You could do Julie Andrews daughter’s books called Little Bo (there are three different books: Little Bo in Italy, Little Bo in France, Little Bo), which I hear are pretty good. Other personal favorites are any of the Margaret Wise Brown books (Goodnight Moon, Runaway Bunny, My World), Paddington Bear (which you could pair up with a Paddington Bear, which on separate occasions I’ve gotten the book and the stuffed bear for my nieces when I was in the UK), Love You Forever, etc. Here are couple of book I’d pair along with pajamas. The Buzz Lightyear PJs are HILARIOUS. I. DIE. But not as cute and hilarious as this. Tell me that is not ADORABLE?!? The hubs was about to get it until he realized it was for kids. 😛 My big baby… he’s adorable too. Might I remind you about his Buzz fascination in this post. 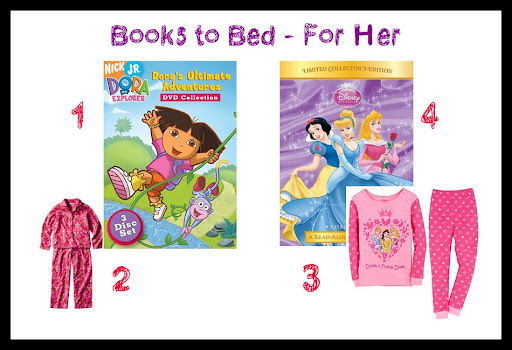 If you’re not into giving books and PJs here are a couple of other ideas for the tot in your life. I personally love giving puzzles to my nieces and nephews. With some help they figure it out and when they’re done, their faces light up with a sense of accomplishment. It’s AWESOME. I’ve given my nieces and nephew DVDs. Like I mentioned before they’re obsessed with Yo Gabba Gabba, but you could always go with classic DVDs like any of the Disney cartoons, Duck Tales, Bugs Bunny, etc. But don’t overload them with TOO much TV, you do want them to go outside sometimes and run around and have an active lifestyle. The other presents that I selected above are either ones I’ve given or classic items that I think a child would like. While I’m not trying to advocate violence, I think inflatable punching bags are cool. So selecting this present is at your discretion. Another thing that I’d give that I didn’t put up here are musical instruments… mainly a keyboard/mini piano, but with that you may want to ask the parents first because of all the potential noise the kid could cause. 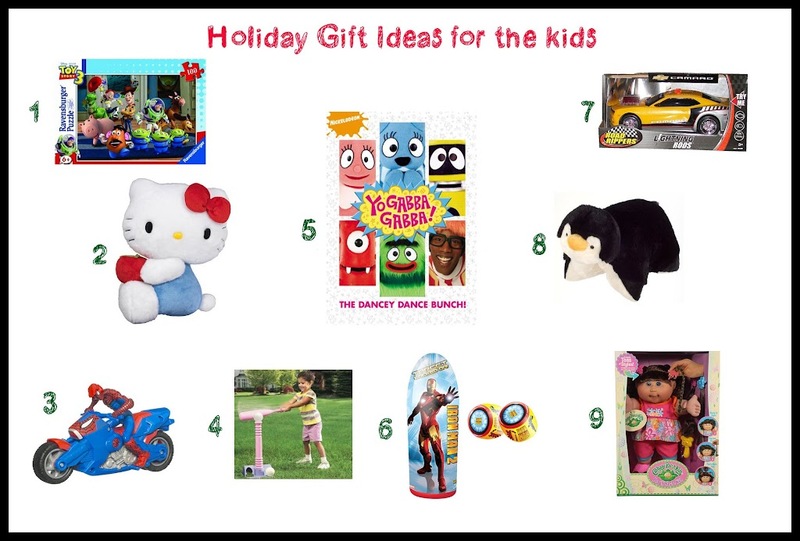 So here’s the plethora of gift idea for the tot in your life. When in doubt get a book or puzzle or dvd! 🙂 TRUST ME they’ll like it. Just do a tad bit of research of what their favorite character is.